On Tuesday, I climbed 115 steps (not including 14 landings) to reach the belltower of Christ Lutheran Church in downtown York. Twice. The first time, church secretary Tracey led me up there so I could make pictures and do some video. You see, for the first time since 1884, the church’s main bell — the one that dates to 1800 and that strikes hourly — is silent due to repair work. © 2011 by The York Dispatch. 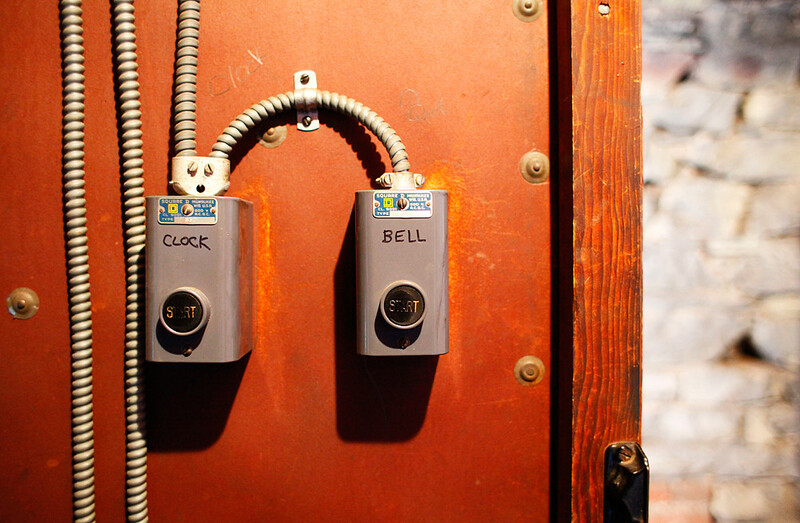 Chuck Roeser, a tower clock renovation specialist from Lockport, N.Y., is one of two clockmakers commissioned by Christ Lutheran Church to renovate its bell system. 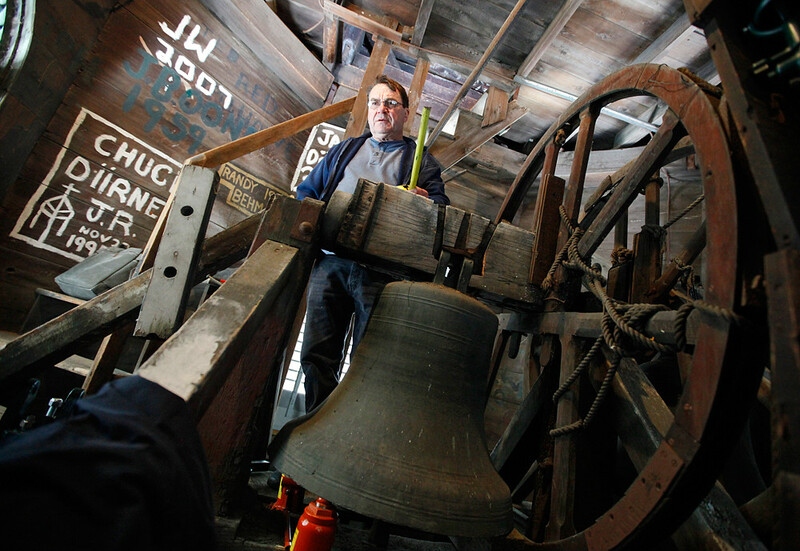 Roeser, a tower clock restoration specialist from Lockport, N.Y., and Bob Desrochers, a clockmaker from Lancaster County, have been hired by the church to renovate the clock and bell system. 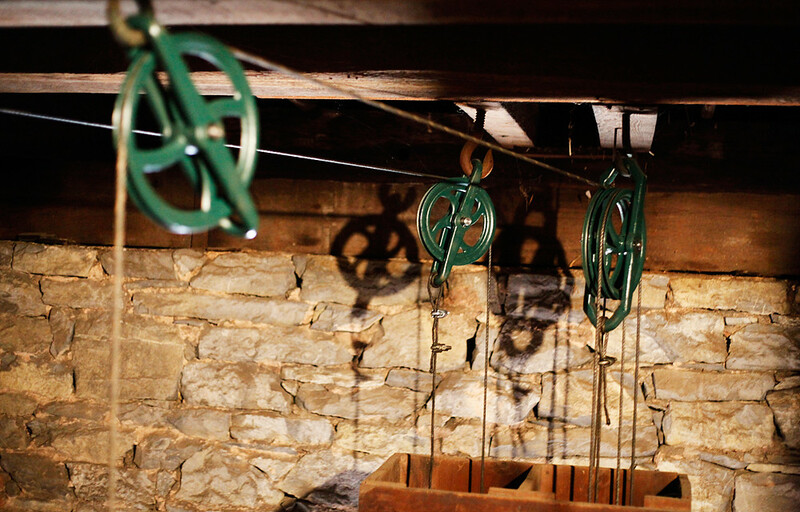 The larger bell, which dates back to 1800, is having its striker replaced to improve the sound of its ring. 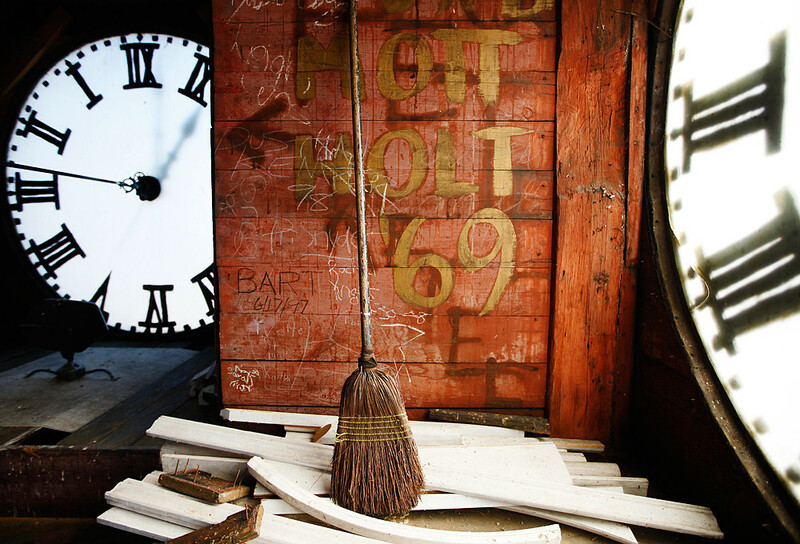 After the bell and various gears and cables are renovated, the clock will undergo renovations. But when Tracey and I arrived, the workers were gone. There was no note nor any indication of when the workers would be back. 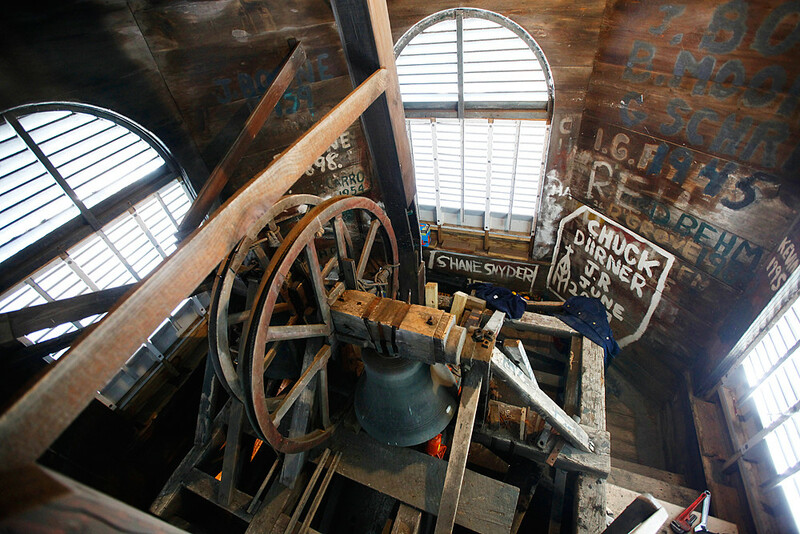 So, figuring the workers would return soon, I hung out in the top level of the belltower (not including the crawlspace right below the cupola, which is accessible by an upright ladder) for a bit. It was a little strange. Normally, when you’re high up in a building, you’re in an insulated, soundproof area. But in the belltower, you’re still exposed to the cold air, you can hear the street traffic below and yet you’re apart from it all. 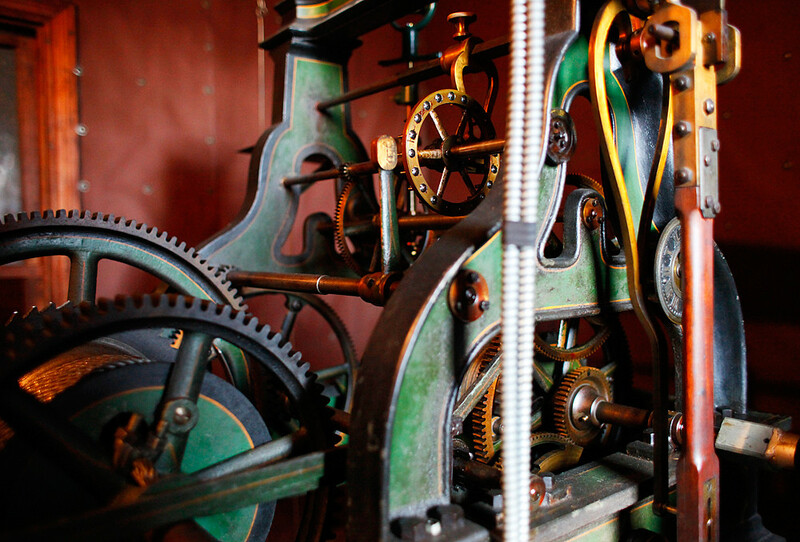 That top level happens to be where the four clock faces are, as well as all the gears and rods and cables needed to synchronize the clock and the bell. There’s also a lot of dust and graffiti. Tracey brought the pastor up to talk to me, and I interviewed him as we were surrounded by the four clock faces. Shortly thereafter, when it was apparent the workers weren’t coming back too soon, I descended the belltower and returned the office. On my way down, I counted the steps and made more pictures. The church was founded in 1733 — eight years before the city of York was laid out. Pastor Patrick Rooney told me the church is the oldest Lutheran congregation west of the Susquehanna River, although the only thing remaining from the original church is a gold flame that now hangs in the sanctuary. While I hung out in the office area, Pastor Rooney showed me the church’s first record book. Of course, it too dates back to 1733, and is incredibly fragile. He also showed me the church’s chalice, which is from Germany and was sent to the church in 1760. Coming from a state that became its own republic 175 years ago yesterday, I was really fascinated: There’s nothing in Texas that dates back to the 1700’s. The workers soon showed up, and I followed them back up to the belltower to make pictures and shoot video of them. This time, I stayed on the bell level, which is only 100 steps from the ground. All in all, a really interesting late morning and early afternoon. It’s not every day that you get to spend a few hours at the top of the city. Be sure to read the article and check out the video I made.